A soup that will warm you up from head to toe! For the Roasted Cauliflower Soup: Preheat the oven to 500ºF. Place the garlic cloves on a piece of aluminum foil. Drizzle with 2 teaspoons of olive oil and wrap the sides of the foil up to create a pouch. Place in the oven and roast until fragrant and cloves soften, about 15 – 20 minutes. Meanwhile, place the chopped cauliflower on a sheet tray and drizzle with 1/4 cup of olive oil. Season with salt and pepper. Place in the same oven and roast for 10 minutes. Remove from the oven and place in a large pot. Add chicken stock to the pot and bring to a boil. Turn the heat down to medium, cover with a lid and continue to cook for 10 minutes more. Remove the garlic from the oven, and remove the cloves from their skin. Leave the oven on, reducing the temperature to 400ºF. Add roasted garlic cloves to the pot and using an immersion blender, blend the soup in the pot until smooth. Stir in the dijon mustard. Season with salt and pepper to taste. For the Parmesan Croutons: In a large bowl, toss the bread, olive oil and parmesan cheese together. Remove to a baking sheet and place in the oven until the cheese has melted, about 5-6 minutes. 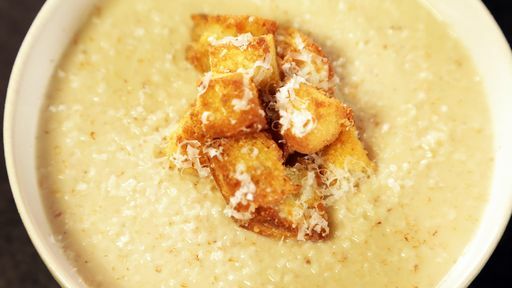 Serve the soup warm, topped with Parmesan croutons and freshly grated nutmeg. Tip: For a speedier solution to roasted garlic, cut off the top of the head of garlic, and microwave in a bowl with small amount of water, for 3 minutes.